Popular game of chance for fetes and fairs. Each lolly stick has a coloured tip, and different colours mean different things e.g. 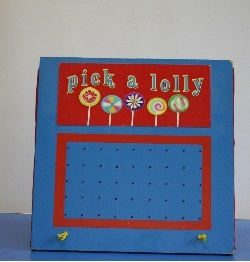 if you pick a lolly with a red tip, you get another go; a lolly with a blue tip wins you a prize; and a lolly with no colour has no special meaning but you get to keep the lolly. Everyone is a winner!